Forest Garden 4 x 6 Shiplap Dip Treated Apex Shed: This compact 4 x 6 shed from the Forest Garden range has a classic apex style roof and includes a single window with strong polycarbonate glazing and a single door which has double Z framing for increased strength and hidden hinges for added security. This garden shed also benefits from a robust and long lasting pressure treated boarded floor and it has an OSB sheet material roof which is protected by the included shed felt roofing material. This wooden shed is from the Forest Garden shiplap dip treated shed range, the robust shiplap design consists of tongue and groove boards that help to keep out the elements. All of the buildings in this range come with a factory applied base coat and will require you to treat the timber periodically; the sheds in this range also come with a 10 year guarantee. 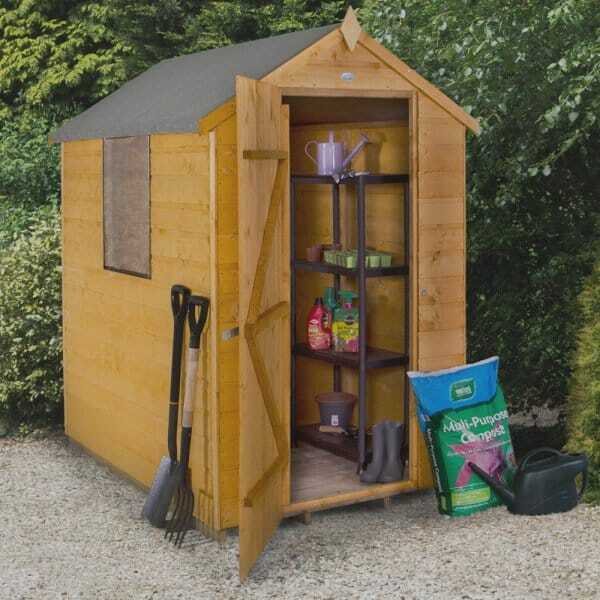 The door of this shed comes with a hasp and staple lock so that you can secure your garden equipment away safely by simply putting a padlock through the staple. This shed is delivered in easy to manage sections for simple self-assembly.